So how does the iPhone 5 stack up against it’s predecessor, the iPhone 4S? And what happens when we pit the iPhone 5 in a head to head battle against the Samsung Galaxy S3? Well let’s take a look! OS : The iPhone 4S was shipped with iOS6 – same for the iPhone 5. The Samsung Galaxy S3 will shipped with Android 4.1 as reported earlier. iOS vs Android – your pick. 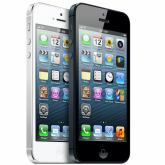 Display Size : The iPhone 5 has a 4 inch display while the iPhone 4S has a 3.5 inch display. Here the Samsung Galaxy S3 has a much larger 4.8 inch display. Personal preference here. Resolution : The iPhone 5 has an IPS ‘retina’ LCD display with a resolution of 1136×640 resolution with 326 ppi (pixels-per-inch), as does the iPhone 4S, though with an 900X640 due to its smaller screen. The Galaxy S3 has a Super AMOLED display, 1280X720 pixels, 306 ppi. As for which looks better? Reviews are mixed – beauty is in the eye of the beholder here. Processor : All three phones have powerful processors from different manufacturers. There’s an A6 Quad-Core in the iPhone 5, a Dual-Core 1GHZ in the iPhone 4S, and Quad-Core 1.4Ghz for the S3. Front Camera : The iPhone 5 gets an upgrade to 1.2 mega pixel front camera from the VGA camera in the iPhone 4S. The Galaxy S3 beats the iPhone by haveing a superior 1.9 mega pixel front camera. Rear Camera : With good photo capturing capabilities being a necessity these days in any smartphone, the iPhone hasn’t improved from the 4S, still going with an 8 mega pixel rear camera. The same is with the Galaxy S3. Connectivity : All the three phones have WiFi and Bluetooth. The iPhone 4S was a 3G phone. The iPhone 5 and Galaxy S3 are both 4G. Storage : Apple iPhones have never supported a MicroSD card, and, unfortunately, the iPhone 5 keeps that tradition alive. But there are three variations in the models, 16/32/64GB. The S3 has two versions 16/32GB, which can be augmented with a up to a 64GB MicroSD. Battery : The iPhone 5 can go upto 8 hrs (3G talk/data use) while the S3 can go upto 11 hrs (3G talk/data use). Build : With the aluminium unibody, the iPhones definitely have better build quality than the Samsung Galaxy S3, which has a plastic body. Looking at these specs, the iPhone is a solid phone, but may lack the oomph factor usually associated with an iPhone. Shoppers who are first time iPhone owners will definitely like the new iPhone, but for present users… the new iPhone may not be as attractive. How do you think the phones compare? Leave your reviews below!